0 item(s) - 0 лв. Kamagata has a flat edge like a Nakiri.. The extended blade height is awesome for people who have bigger hands and have a tough time keeping their knuckles off the cutting board. Originally designed to cut rubber soles for shoemaking, the Kamagata compliments any knife collection. The Usuba is ideal for cutting vegetables and fruits which are served raw, because the thin and sharp blade produces cut surfaces with very little cell damage, and this minimizes the discoloration and change in flavor often caused by oxidation. The versatile middle section of the blade can be used for thinly slicing vegetables. 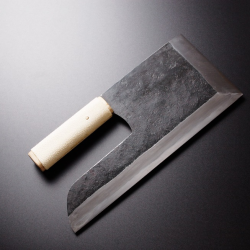 The relatively tall and long blade of the Usuba make it ideal for tackling large ingredients, such as cabbages, but it is not recommended for cutting vegetables or fruit with hard skins, because they may damage the blade. The tall blade is also very useful when using the knuckles of your free hand to guide the blade during cutting, and this is useful technique to develop if you want to consistently cut vegetables at a particular thickness. Length: 210 mmWeight: 280 gr.. Length: 225 mmWeight: 350 gr.. Length: 240 mmWeight: 400 gr.. Length: 165 mmWeight: 140 gr.. Length: 180 mmWeight: 210 gr.. Length: 195 mmWeight: 230 gr.. Length: 210 mmWeight: 245 gr.. Length: 225 mmWeight: 270 gr.. Length: 240 mmWeight: 270 gr.. Length: 270 mmWeight: 290 gr.. Length: 210 mmWeight: 300 gr.. Length: 165 mmWeight: 190 gr.. Advise me how to ....? Copyright © 2018, Chunche EOOD, All Rights Reserved.